It’s hard to believe that we are in the midst of Autumn what with this beautiful Indian Summer, but all good thing must come to an end, and to be honest, when we look to the trends forecast for Autumn/Winter we just can’t wait to transition shorter days, all curled up with cosy knits and a cup of hot cocoa. So here are our tips to get you to embrace this seasons interior trends. Simply by adding texture to chairs, sofas and even walls, you can instantly change the feel and ambiance of a room. Natural textures are big this season across fashion and interiors alike, think big chunky knits and woven fabrics. Simply adding a knitted throw as a feature on the sofa will give add to the cosiness of a room. Knitted pouffes are also a great and subtle way to introduce texture. If you have space on your walls, weaving is very hot right now and makes a great and inexpensive feature. Following on from natural textures, handmade tableware is a simple and inexpensive way to make a change in the home. Look for pieces, which aren’t all perfectly formed and have an artisan quality. If you don’t want to add to your tableware, just key pieces like a vase or jugs would look wonderful, perhaps filled with seasonal blooms would look just as wonderful. There is something so relaxing and calming about walking into a room with a flicker of candlelight. You can really make a statement with candles either with colour or scent. We love a little of both and The White Company are simply the masters of this making a perfect fusion of a decorative accessory and a sensory experience. Natural pieces add to the cosiness of a home and it a wonderful way to bring the outside inside and shutters are a great way to do this. 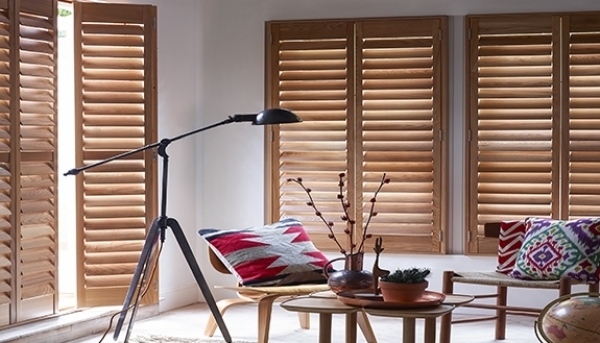 We offer a range of natural shutters, our premium elm shutters being the most popular as these are made from luxurious timber and allow you to see the grain running through the wood. Add a stain of your choice to give warmth and a sophisticated finish then sit back and enjoy your beautiful room.